I'm not the biggest fan of wartime history. In fact, I don't like wartime history at all. Why? Because it's usually all the same to me. I've been bored of British soldiers, American GIs, and Nazis for a long time now (thanks for that, dad). So when I came across Between Shades of Gray and found that this book is about how the Soviets treated people, I was pretty intrigued. Most of the things that happened in this book were things that I had no idea had happened. And I think that's what made me like this book so much: I was learning things I didn't know before. Between Shades of Gray tells the story of Lina and her family, who have been arrested by the Soviets and taken from their home in Lithuania to a forced labour camp in Siberia. There, they become victim to the cruelty of the NKVD, who beat, humiliate and even execute people for the smallest of reasons. The fact that I didn't know about this made the book all the more powerful and led me to doing some wider reading about the subject. I think what also made the book as powerful as it was, was how bleak it felt at times. Every time I picked up the book, I felt the exact same way the characters did: I wanted some fortune to come their way, but when it didn't, I wasn't disappointed and that kept me coming back to read. Speaking of characters, I really liked how they were fleshed out to feel like real people. No matter how hard they tried to be strong, they were all broken shells and I couldn't help but feel sorry for them. One thing that I thought was a bit peculiar was that not many of the characters have names except from the people Lina already knew. By the end of the book, they'd been together for a long time, so why do they still not have names? Speaking of a character with no name, there was one character that I just wanted to throttle every time he said something. This character is known simply as 'the bald man' and, good God, he is annoying. I'm a fairly cynical, unoptimistic person myself, but he just took is to so much of an extreme that it was incredibly irritating. As I'd said earlier, reading this book was a bit of a learning experience for me because I didn't know about this, so I can't really comment on how historically accurate it is. But that aside, it does feel incredibly well researched. Throughout the book, there is a strong theme of hope, which really hit me, personally. There have been times where I thought I couldn't do something and wanted to give up, and reading Between Shades of Gray made me realise that if people in conditions like this truly believed that they were going to make it out alive, than I can have faith in myself. 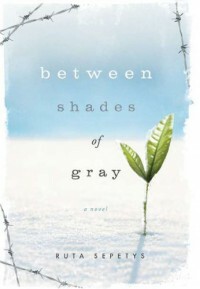 Overall, I really enjoyed Between Shades of Gray. It's definitely convinced me that not all wartime history is the same and has sparked an interest in wanting to learn more about the Soviet Union and what went on during its existence.